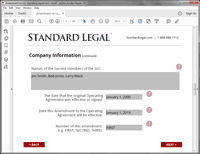 Amend the Operating Agreement for a Limited Liability Company formed in any U.S.A. state. 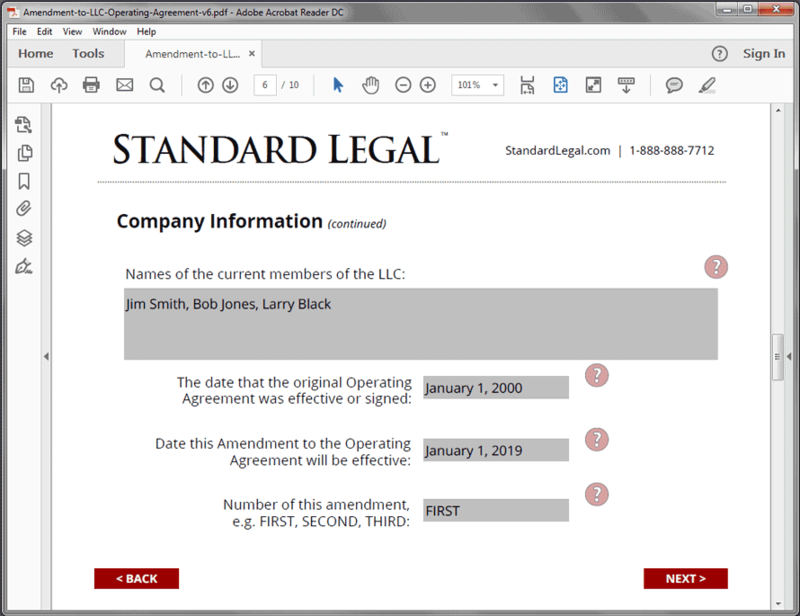 If any of the critical business details of your LLC have changed since its formation, it is often wise to amend the terms defined in the Operating Agreement to reflect the current structure of the entity. 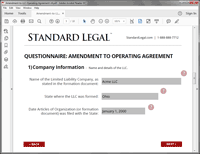 Create an addendum outlining these changes in minutes using the amendment document software from Standard Legal! A Limited Liability Company (“LLC”) is formed by the filing with the Secretary of State the Articles of Organization or Certificate of Formation. The filing of this document with the State establishes the legal existence of the LLC, but does not necessarily set forth the rules and regulations for the operation and management of the company. 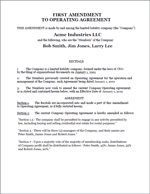 These rules and regulations are set forth in the LLC’s Operating Agreement. The Operating Agreement allows the owners of the LLC (known as “members”) to create or draft rules and regulations to govern the operations of the business of the LLC in a way that meets the specific needs of the business and the members. The Operating Agreement can appoint individuals to manage the business, can dictate how profit generated by the business will be divided among the members, can require majority or unanimous voting limitations on certain business matters, etc. There are times when the provisions of an Operating Agreement need to be changed or amended. 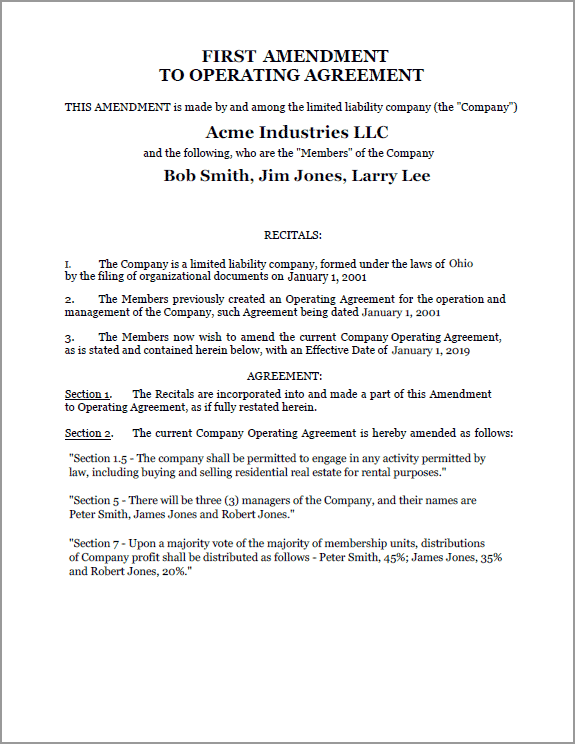 An amendment may be desired by the members of the LLC if: the nature of the business of the LLC changes over time; if new members are brought into the LLC; if managers or members resign or retire; if the members wish to set forth a new or different manner of distribution of LLC profits; or a multitude of other reasons which would necessitate a change to the operating documents. 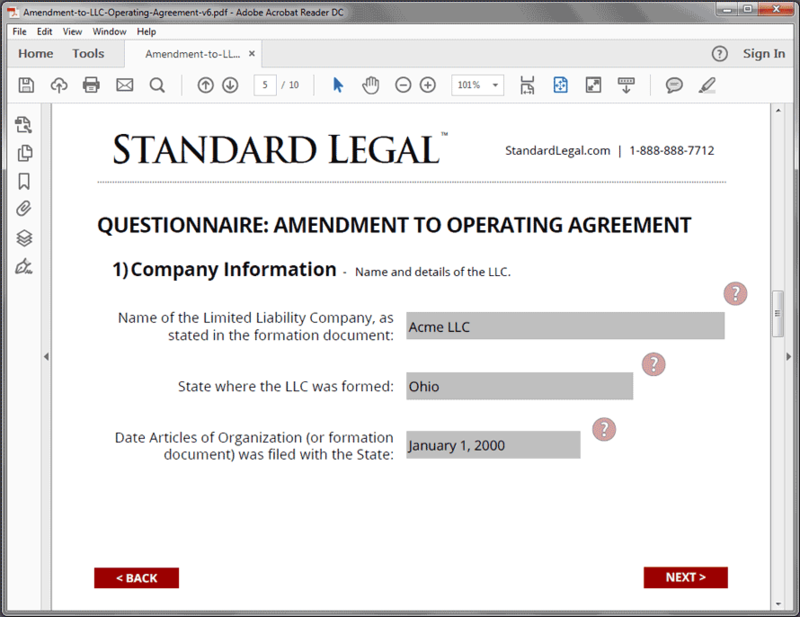 This Amendment to LLC software from Standard Legal allows the Members of the Limited Liability Company to amend the terms of the Operating Agreement to clearly state the updated goals of the entity. When making an amendment, the user should be specific in which provisions of the original documents are being changed, updated or deleted. 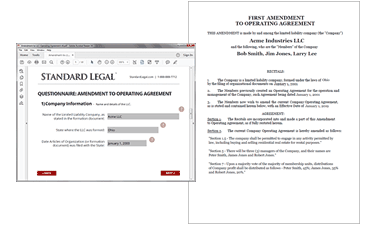 This is done by referencing the exact language of the section or paragraph of the original document, then stating the changes to be used going forward. Example paragraphs are provided as a guide to making these revisions.